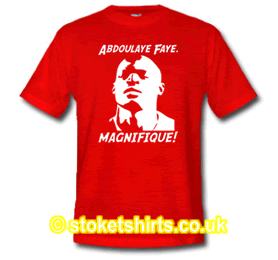 Abdoulaye Faye - Undoubtedly Tony Pulis' best signing in 2009. Abdy has quickly attained the status of cult hero once held by the likes of fellow centre halves Georgie Berry and Denis Smith. 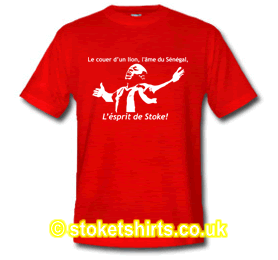 In our latest tribute to the skipper (as in club captain and post match celebrations!) we praise him in his native tongue. The text says " Le coeur d'un lion. 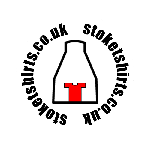 l'âme du Senegal, l'esprit de Stoke." 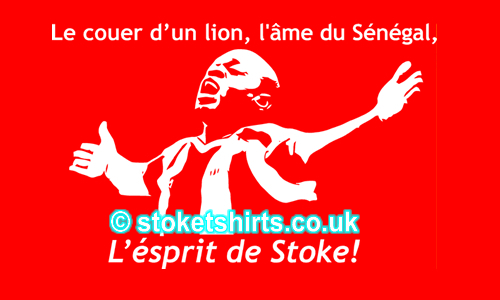 Translated it means The heart of a lion, The soul of Senegal, The Spirit of Stoke. 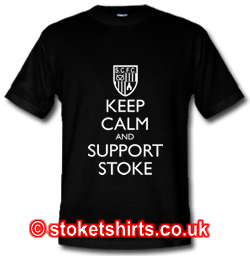 I am sure we would all agree these words, which capture all that Abdy is about.